Individuals with disabilities, as well as experts in the field of disabilities, came to Mountain View Elementary to set up eight different stations for presentations on a wide variety of physical and cognitive disabilities. These experts presented information about disabilities to our students and staff and provided engaging activities that facilitated the understanding of challenges that individuals with disabilities face and overcome on a daily basis. Among other activities, students had hands on experience with creating and reading Braille, using alternative communication devices and manipulating artificial limbs. Art was the focus at one station where students worked with illustrator Maggie Winston to paint without using their hands. Her artwork, done holding the paintbrush in her teeth, was yet another example of focusing on abilities as opposed to disabilities. 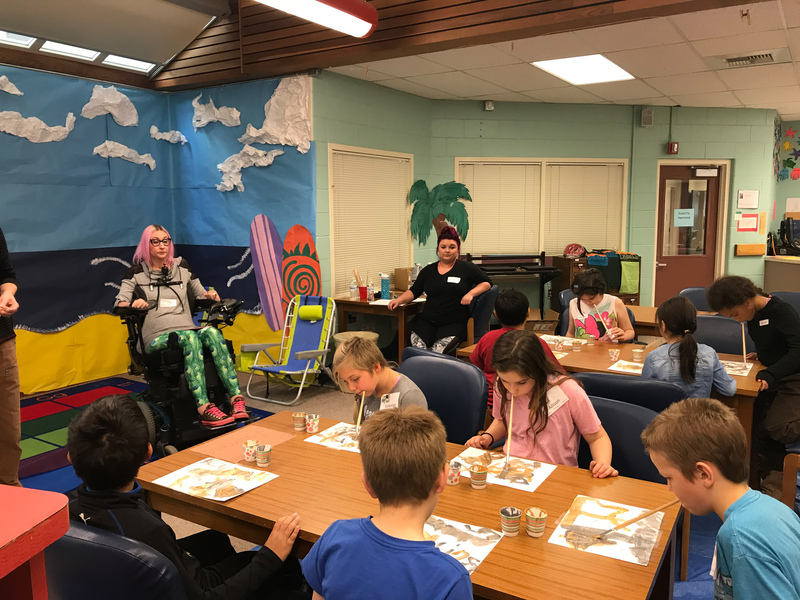 As KPBSDs largest open enrollment elementary school, Mountain View provides a number of programs designed to meet the needs of students with disabilities. All of our students benefit from their daily interactions within this diverse student body. It was our hope that this year’s Diversity Day would broaden this natural development of empathy and further prepare our students to participate in an inclusive society. Kindness was the focus of a school wide assembly. A variety of short skits, songs and other presentations focused on all aspects of kindness. Teachers and students from across the school teamed up to celebrate the conclusion of our annual start of the year, and eight weeks focus on Positive Responses to Conflict and Kindness. During these eight weeks, age appropriate lessons for our teaching kindness, empathy and our six positive responses to conflict happen at all grade levels. Combined, these two events provided a powerful message to our students of what we value here at Mountain View Elementary, Kenai’s Neighborhood School. This entry was posted on July 5, 2018 at 2:54 pm. You can follow any responses to this entry through the RSS 2.0 feed. You can leave a response, or trackback from your own site.